Shows at Maxwell’s are always a treat, in no small part because you get to spend quality time with a relatively “big” band in a venue much smaller than they normally play (we caught them at Bowery Ballroom not too long ago). This show by The Black Angels – in town for a series of shows, including headlining the 4Knots Festival – fit that description. Packing the 200-capacity room, the Angels blew out the room with their layered, reverb-heavy sound. One could be forgiven for thinking they were a band out of Manchester or thereabouts rather than one of America’s top music towns, Austin, Texas – their baggy sound shares as much commonality with mid-90s UK rock as it does with the “psychedelic rock” tag the band usually finds stuck to them. This set proved that the band could rock like a huge band even in a small room (and without the killer light show they had last time), with the big rockers like “Black Grease” getting obvious love from the Friday night crowd. Unsurprisingly, the set focused heavily on their 2010 record, Phosphene Dream, which has earned them proper critical acclaim. I could hope to see them again at Maxwell’s in the near future, but let’s face it, this band is probably headed for Terminal 5 (and good for them). hi and lo and I recorded this set with a four-mic mix from our usual spot in the venue. The band’s sound engineer would not permit us to utilize a soundboard feed, but the sound is nonetheless excellent. Enjoy! This recording is now available as FLAC or MP3 download at Archive.org [HERE]. If you email nyctaper for access to this recording, we expect that you will PLEASE SUPPORT The Black Angels, visit their website, purchase Phosphene Dream directly from the band at the front page of their website [HERE]. The Black Angels take their psychedelia very seriously. As the hosts of Austin Psych Fest and one time backing band for Psych legend Roky Erickson (13th Floor Elevators), the band certainly has the pedigree. 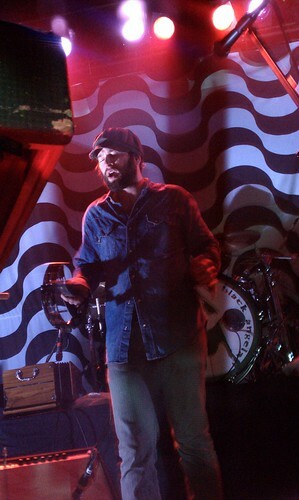 But as we saw on Friday night at Bowery Ballroom, Black Angels also have the songs, the stage show, and the sound. From the opening intro music of “Good Vibrations” that warped into a reverbed and looped mutation of the song before the band dropped right into their own “Bad Vibrations” opener, it was quite clear that this would be more than just a “trippy” adventure, but a true journey through an authentic ninety-minute psychedelic musical show. The band has the obvious 60’s influences, including Roky and also some of the California sound, but also draws heavily from the eighties revivalists like The Cramps and The Gun Club. Each song provided a sonic burst of reverb and effects accompanied by a mesmerizing light show. The setlist included a nice selection from the band’s three full length albums, including seven songs from 2010’s Phosphene Dream (although oddly not the title track), and five songs from the debut album (stream “Black Grease” below). The persistent hum of the drone machine melded each song into the next before the close of the main set. The band was called back for three encores and closed with a feedback drenched “You in Color”. I recorded this set with the four microphone rig from the standard balcony rail location, and this recording is an authentic capture of the sound in the venue that evening. Enjoy!